What is it about Bodrum? The glah-mour, my darlink, the glah-mour. Glamorous Bodrum was not always so. It used to be a quiet fishing village of 3000 on the Aegean Sea until Ahmet Ertegun, founder of Atlantic Records, built a villa in the 1970s and invited his celebrity friends to party down. Today Bodrum is Turkey’s version of St. Tropez with a million visitors in high season, including Arab, European and Hollywood royalty. Bodrum may be a classy town but low impact travelers like my sister Cat and I have plenty of reasons to embrace it, too. We can’t tell you about the picturesque beaches sprinkled along the coastline of the Bodrum Peninsula because we arrived too close to off-season in late October. Nor can we tell you about Bodrum’s pulsing nightlife because we are of the early-to-bed-early-to-rise persuasion. We didn’t indulge in a Turkish bath because we experienced that in a more authentic place in Istanbul at a 300 year old hamam. We didn’t peak inside the harbor mosque although females are admitted. The mosque’s other worldly call to prayer reverberating over loudspeakers made for a jarring contrast to the chic, seductive city with which it seems to vie for attention. Apart from a glorious morning jog on a long paved path hugging the sea, Cat and I didn’t do anything active or sporty during our stay in Bodrum. Ours was a subdued visit that took in strolling, window-shopping and historical sightseeing. Bodrum’s charismatic persona is enhanced by its distinction as a world class wooden sailboat center. Cat and I are landlubbers, yet even we were bedazzled by a harbor lined with dozens of smoothly polished wooden sailing yachts known in Turkish as gulets. As we walked long stretches of the wide seaside promenade we observed many members of the carefree sailing crowd relaxing on their decks with glasses of wine. I didn’t, but one could easily envy these slim, suntanned, smiling bodies perched in comfort on display to passing pedestrians. I don’t know if the harbor usually has such a bountiful succession of first-rate yachts or whether this day was exceptional because it coincided with the 22nd annual Bodrum Yacht Festival. We arrived though on the last day, too late to glimpse the Bodrum Cup, an international wooden yacht regatta that our local friend Mahmet and his son competed in with their gulet. When Cat and I met up with the guys they were still bubbly and energized by the event. There was a peppy air in the streets, but my guess is that “festive” is Bodrum’s default mood. I was already familiar with Bodrum’s fame as a wooden yacht haven because my Greek partner Yiannis builds wooden sailing boats. 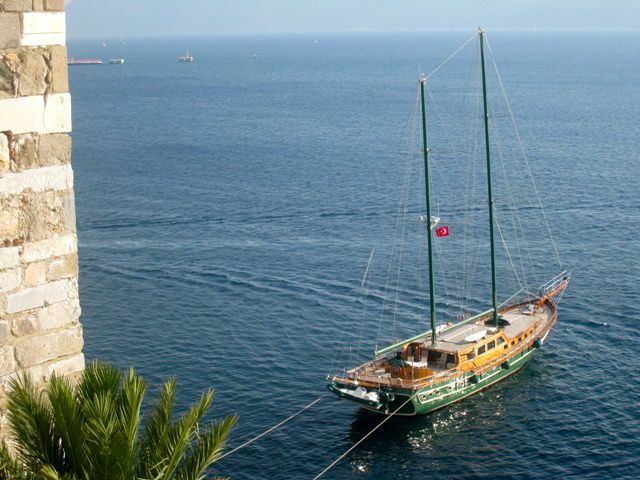 In 2002, I accompanied him as he and a crew sailed his 90 foot gulet, the Poseidon, from the Greek island of Kos into a Bodrum shipyard for repairs. On dry dock I scanned a horizon of scores of wooden masts, reminding me of a forest of tall thin leafless trees. The abundance of masts led me to believe that this was surely Bodrum’s only wooden shipyard. Wrong. I was surprised to learn that Bodrum has numerous shipyards exclusively for gulets. Given the painstaking maintenance of a wooden sailboat, who knew wooden shipbuilding is such a big business? I see a smattering of wooden yachts in Greek waters but nothing like Turkey, or at least Bodrum, where the industry is apparently thriving. In contrast to Greece, land of the Argonauts, where the art of wooden ship building is now shamefully all but extinct, the Turkish government has been busy rewarding its citizens with huge tax incentives to build wooden sailboats. That Turkish rather than Greek wooden yachts dominate the Eastern Mediterranean is not a matter of Greece’s recent economic woes. In the last several generations, as Greeks have dashed for modernity with a frenzy akin to a Black Friday shopping spree, traditional crafts, such as, stone wall construction, weaving, basket making and wooden ship building have gotten trampled afoot. Perhaps Turkey, still a developing country, will approach modernization with less cultural brutality. Wooden sailboats are not a contemporary fad in Bodrum. The roots of Bodrum ship building go back centuries to when it was a Greek city called Halicarnassus, known throughout the ancient world for producing fine sailing vessels. Kings and pharaohs commissioned local shipyards to build mighty warships, trading boats and triremes, all wooden of course. Halicarnassus was famous for other reasons, too, including the homeland of the world’s first historian, Herodotus. Before going to Bodrum neither Cat or I knew that it boasts one of the Seven Wonders of the Ancient World. 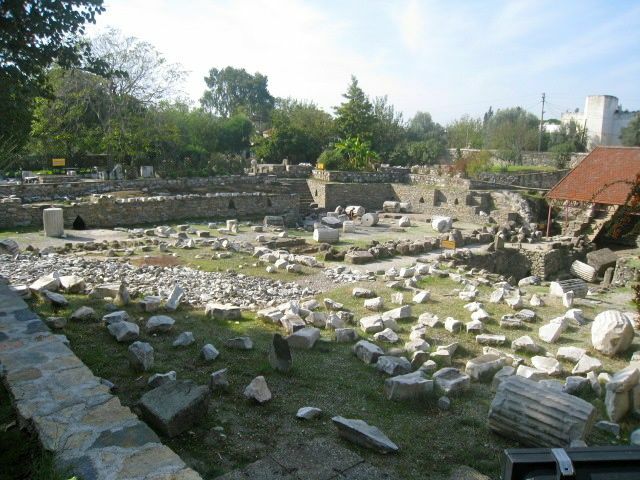 When King Mausolus of Halicarnassus died, his wife built him a magnificent white marble tomb – yes, a mausoleum -- that awed everyone until its destruction nineteen centuries later, most likely by an earthquake. Cat and I toured the grounds of the Mausoleum but there’s not much to see. You have to strain your imagination to make sense of the rubble or resort to the computer models to get a sense of the building’s majestic proportions. There is little signage at the site and what’s there is as inviting to read as an archaeology scholar’s PhD thesis. We did learn this morbid tidbit: Mausolus’ widow mourned him by drinking a daily concoction containing her husband’s ashes. The most pleasing displays are the bas reliefs depicting the Greeks in combat with the race of warrior women known as Amazons. How many Seven Wonders of the Ancient World can you name, let alone visit? For that reason alone, we recommend a pit stop at the Mausoleum. One of the most awesome women in history hailed from Halicarnassus and her story is a blockbuster. Artemisia was the only female commander of a fleet of ships at the momentous Battle of Salamis in 490 BC. At that time Greek city-states on the west coast of what is today Turkey were controlled by Persia. When Xerxes attacked Greece some of his Greek subjects, including Artemisia, allied with the Persians in a naval conflict that changed the course of Western Civilization. Although greatly outnumbered, the Greek triremes devastated the 1200 or so Persians ships – five under Artemisia’s command -- which ultimately led to the demise of the Persian empire. Boldly advising Xerxes on strategy and fomenting intrigue left and right, Artemisia’s audacious role in the Battle of Salamis begs to be told on the big screen with no less than Angelina Jolie in the starring role. Bodrum is missing the boat, so to speak, by neglecting to erect some kind of commemoration to this illustrious Halicarnassian leader. Anyone who enters Bodrum by sea is forced to reckon with its most famous landmark, the Crusader castle imposingly guarding the narrow entrance to Bodrum’s bay. This fortress is open to the public and it is magnificent. Cat and I spent at least half a day touring its grounds where peacocks, doves, roosters, cats and dogs amble freely. 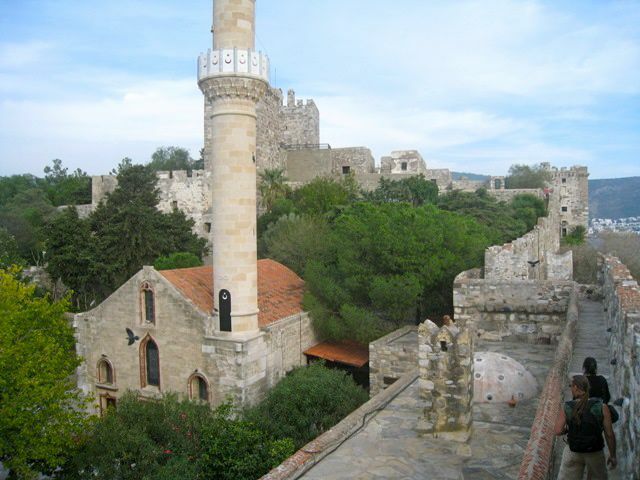 We explored the towers, gates, parapets, multiple stories, moats, dungeons, Ottoman cemetery – we couldn’t get enough of this enchanting medieval bastion. The castle was built over a period of years by the Knights of St. John beginning in 1402. Its presence in the land of infidels was considered so important that the Vatican issued a decree declaring that all Christians who came to assist in its construction would receive . . . drumroll, please . . . a guaranteed reservation in Heaven. (Here’s where a TV barker cries, “Come on down!“) On Asia Minor’s western coast, this fortress was the only asylum for Christian refugees and certain dogs were specially trained to track down any wandering flock and bring them to the safety of the castle. The Crusaders looted pagan King Mausolus’ tomb to construct the castle chapel. You can see the Mausoleum’s stonework embedded throughout the castle walls. Applause to the castle’s curators for abundant and edifying signage. Exhibits are not confined to the history, flags and weapons of the Knights of St. John, but cover an array of tantalizing topics. The spiral Snake Tower is where you can read about ancient medicine practices, including healing with snakes. The impressive amphora collection, many found by Bodrum sponge divers, come from around the rim of the Mediterranean. Ceramists of antiquity inscribed their names and a cluster of grapes on an amphora to indicate origin much like today’s international “Appellation Controllee” winery practice. In 1893, the castle became a prison at which time a Turkish bath (hamam) was installed. Perhaps in the pursuit of historical exactitude, this area’s exhibits include archaic urinals and graphic posters explaining how people went to the bathroom back then. I kid you not! We loved the celebrated Bodrum Museum of Underwater Archaeology which showcases amazing excavations from ancient shipwrecks by nautical archaeologists. There’s a neat life size replica of a portion of a 7th century sunken ship that you can walk through (we did) whose artifacts were arranged exactly as they were found in the sea. Another exhibit consists of shards of delicate glass from all over the early Islamic world. Since few of the pieces fit into a whole, archaeologists believe the ship was carrying refuse glass as cargo to be recycled. Not surprisingly, this lively and innovative museum was named European Museum of the Year in 1995. We were lucky to have contacts in Bodrum with a family where both husband and wife, and both their parents and so on going back some generations, are indigenous to Bodrum, and not foreign arrivistes. Mahmet Koylu is a sailor with his own gulet. In the world of Aegean mariners he met my partner Yiannis almost two decades ago. Several years ago Yiannis came to Mahmet’s rescue when Mahmet lost his dinghy near Antiparos, bringing him another one from Piraeus and not asking a dime for his efforts. So now Cat and I have become the beneficiaries of Yiannis’ good Samaritan gesture. 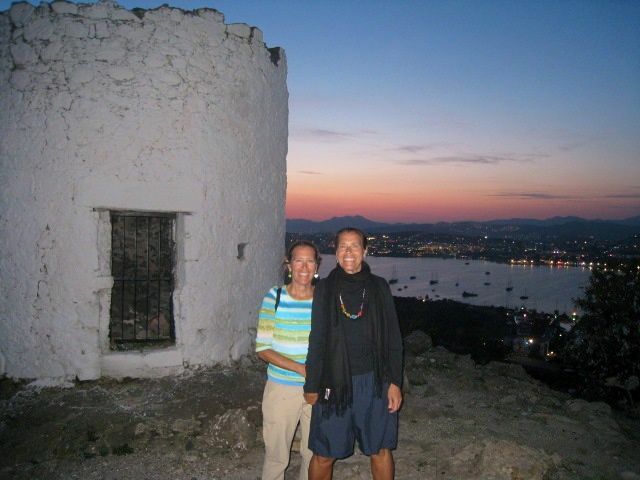 Mahmet and his wife Sevilay insisted we stay in their home on the Bodrum Peninsula in a spare upstairs bedroom. They fed us traditional Turkish food and wouldn’t let us pay for a single meal even when it was we who invited them out for sinagrida (sea bream in Greek), a fairly expensive fish in Aegean restaurants. Bodrum would not be so capable of accommodating the deluge of summer sojourners if not for the Bodrum Peninsula. Stretching westward for 175 kilometers, the peninsula is surrounded by thirty islands and islets and blessed with green forests, sandy beaches, and mandarin orchards. About a dozen or so towns punctuate the peninsula, some of which are overrun with shrill tourists in high season while other precincts harbor residents in secluded luxury. I’d say for a certain crowd the Bodrum Peninsula is to Bodrum what the Hamptons on Long Island are to Manhattanites. Like every vacation for those of us not yet retired, there’s never enough time to see all a destination offers. Cat and I just barely dipped our toes in the Bodrum Peninsula and probably wouldn’t have seen an inch of it but for the hospitality of Mahmet’s family. 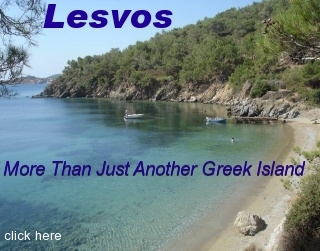 They live in Bitez, a 15-20 minute drive from Bodrum and a five minute walk from the sea. Bitez means “full of trees,” an apt name because it is the peninsula’s citrus center. Near the family’s home is their plot of land where they harvest tangerines and succulent figs and lemons, all of which they served us during meals. We walked a block away to Mahmet and Sevilay’s summer business, a small hotel called Small World. Relying on an agent, their clientele is mostly British and Scottish. Nearby in Bitez’s marina Mahmet proudly showed us his immaculately maintained gulet also called Small World. This “Small World” theme they’ve adopted makes me think that for Mahmet and Sevilay they probably regard their hometown Bodrum in its current sophisticated incarnation like a dear childhood friend who takes a different, diverging path in her adult life. On the other hand, the couple’s eager and enterprising son, Suleyman, is reveling in all the glamour Bodrum offers up a handsome local bachelor, although he also has his parent’s feet-on-the-ground centeredness. He runs his own upscale car washing and detailing service in town that caters to foreigners like Backroads, the high end adventure tour operator. He loves his work and when Cat asked him what he likes best about it, he replied with his flirty smile that luxury vehicles come to his place enabling him to check out the hottest latest features of the hottest latest models. His own car is a BMW which he drives with as much care as a schoolbus driver entrusted with kindergarten passengers. When it came Suleyman’s turn to show us a special scene in his hometown he didn’t hit the nightclubs of Bodrum. Instead at dusk he drove us up to a certain hill crowned with a half dozen abandoned white windmills, the kind you see in the Cyclades. 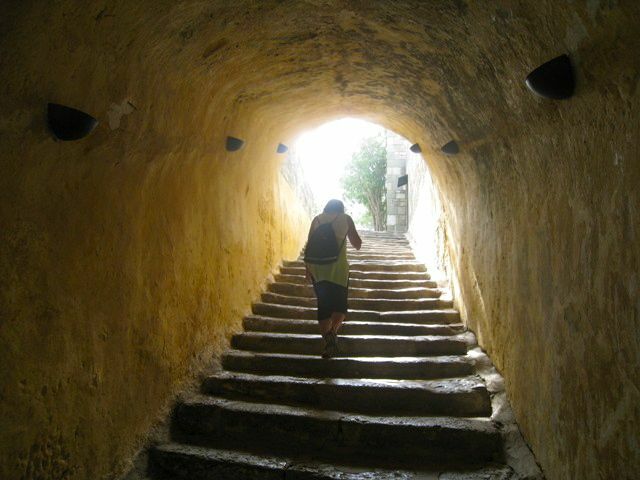 The hill was actually a long thin strip of land jutting into the sea with Bodrum bay, the city and castle on the east side and the expansive peninsula with fewer lights and Bitez’s bay on the west side. From on high the city of Bodrum appears in elegant splendor with all its stark white houses amphitheatrically situated around the sea front much like a Cycladic island. The windmills, the diminishing sunset and the panoramic view were marvelous. There were a couple of other cars up there but no stores or tavernas, not even a kiosk. Suleyman said he comes here often, and who wouldn’t? Whether you are a local lad appreciating your blessed roots or a tourist in search of romantic views, Bodrum delivers. You can click on the above photos to see them full size. For a reliable travel agency see www.fantasytravelofturkey.com who can book your holiday all over Turkey as well as Greece and the Greek Islands.